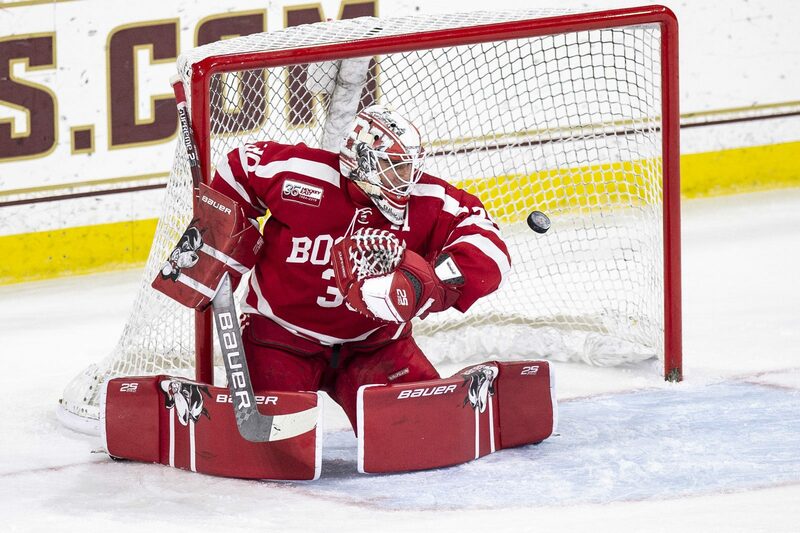 One night after giving up four goals against Boston College, Boston University men’s hockey’s junior goaltender Jake Oettinger responded with a season-best showing. Oettinger’s 42-save effort against the Eagles (4-6-2, 4-1-2 Hockey East) was his best this season and helped the Terriers (4-7-2, 4-4-2 Hockey East) secure a 0-0 draw Saturday night for the first time in the teams’ more than 100-year history. On a night at Conte Forum in which BC outshot BU 42-26, Oettinger was put to work in the game’s opening minutes. The Eagles were the more aggressive side in the first period, putting up 16 shots to the Terriers’ 10 attempts. BC’s dominance was highlighted by an opening 10 minutes that saw junior goaltender Joseph Woll face just one BU shot while Oettinger had already stopped seven. Of the 42 saves Oettinger registered, his biggest came in the final minutes of the second period. With the puck on his stick, freshman forward Joel Farabee tripped in front of Oettinger’s goal. BC’s leading scorer David Cotton seized the puck and shot at an empty net, but the junior forward’s effort clipped Oettinger’s shoulder pads and sailed over the goal. The third period saw a more engaged attack from the Terriers. Senior captain and forward Bobo Carpenter ripped a shot that clanked off Woll’s left post and ricocheted out of play. Later in the period, freshman forward Jack DeBoer tested Woll, who caught the puck for one of his 26 saves. A five-minute overtime followed regulation, where BU’s last chance of the game occurred with seconds remaining. Farabee had a 1-on-1 breakaway with Woll off a long pass, but the Cicero, New York, native shot right at the BC goaltender. Between the two games this weekend, Oettinger and Woll combined for 133 total saves, with Oettinger edging out Woll 69-64. Oettinger said he looks to his Chestnut Hill counterpart for motivation and improvement in his own game.